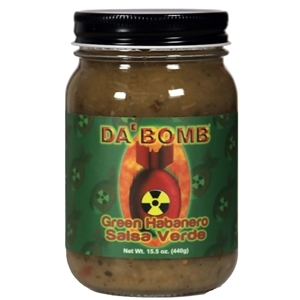 To make a salsa verde worthy of the Da' Bomb name, they had to source the hottest chile peppers they could find. In the mountains of Peru, they grow green Habaneros that have the perfect balance of heat and flavor to create of the hottest green salsas on the planet. This bold fusion of green jalapenos, green habaneros, and a touch of lime lives at the crossroads of where pleasure and pain intersect. Ingredients: Jalapenos (jalapeno peppers, distilled vinegar, salt, acetic acid), water, green chiles (green chile peppers, salt, citric acid), green habanero peppers, onion, garlic powder, garlic, salt, onion powder, cane sugar, lime juice concentrate, spices, ascorbic acid, xanthan gum, natural flavor.